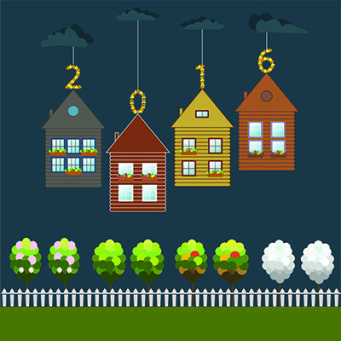 This year has brought steady improvements in the real estate market. Prices rose driven by lower inventory in many markets, and consumers remained relatively optimistic about the economy and its direction—an encouraging indicator for real estate. While the long-anticipated increase in interest rates will likely occur in 2016, a number of positive signs point to a balanced market with benefits for both home buyers and sellers in the next year. For example, an increased supply of inventory and slightly more transactions are expected in 2016. Home prices are forecast to see modest improvements as well. First-time buyers play a critical role in driving the real estate market forward, and 2016 is well positioned to see a rise in these first timers. While the current percentage of first-time buyers is below the historic average of about 40 percent, it is continuing to rise. Further, first-time buyers were estimated to have driven 45 percent of the growth in sales in the past year. (4) With rents continuing to climb in most housing markets and prices increasing, first-time buyers will be motivated to make the move in 2016. Additionally, while home prices have increased, financing costs remain low, making home ownership more appealing to first-time buyers. An obstacle for many would-be buyers earlier this decade was the difficulty of qualifying for a home loan or saving sufficient funds for a down payment and closing costs. Some new loan programs, though, allow buyers, particularly first-timers, to make a down payment as low as 3 percent of the purchase price. In addition, tweaks to lending standards are beginning to encourage lenders to be more lenient with borrowers. While good credit and a reasonable debt-to-income ratio are mandatory for a loan approval, borrowers may be surprised in the coming year to find that they can qualify for a mortgage more easily than in past years. If you’ve made the decision to buy, sell or move up into your next home, W.C. & A.N. Miller Realtors® | Christie’s International Real Estate offers multiple services that can help you find, finance and insure your home. Representatives of Prosperity Home Mortgage are available in our office to assist prospective buyers with financing. Hill Slowinski works with first-time buyers and more experienced buyers and ensures a smooth transition. In addition, Hill has a range of contractors he can recommend to provide home maintenance service to buyers and sellers before and after they buy a home. Jeffrey S. Detwiler is president and chief operating officer of The Long & Foster Companies, parent company to W.C. & A.N. Miller Realtors®, Long & Foster Real Estate, the No. 1 family-owned real estate company in the United States, and Prosperity Home Mortgage, LLC, a full-service mortgage banker. From extensive, neighborhood-level market information to Long & Foster’s core services companies, providing mortgage, settlement, insurance and property management services in a streamlined manner, Long & Foster offers the services necessary to make today’s real estate transactions manageable for owners and investors. *The information contained in this article is not intended to be and does not constitute financial or investment advice.